Budapest is getting a buffeting from a wind from the east. At least that is how some in Hungary greet the visit of Russian President Vladimir Putin, and the courtship ritual he and their leader Viktor Orban appear wrapped up in. 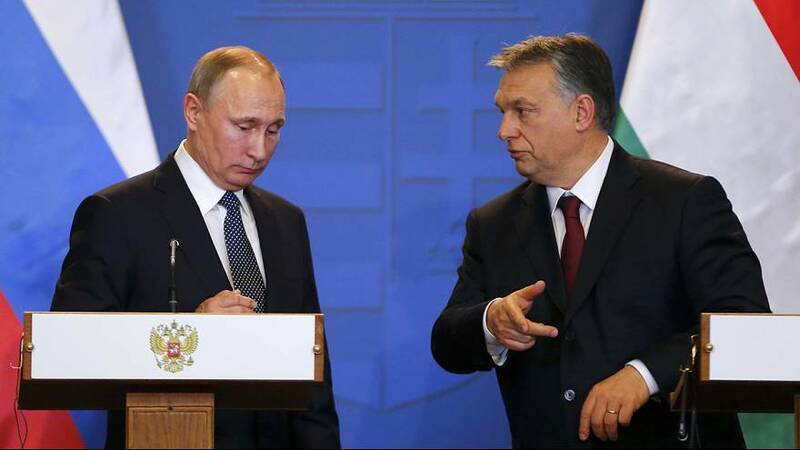 Orban has been going out of his way to butter the Russian leader up. Orban knows this is not his first contradiction rodeo. He got elected on the slogan “Russians Out” when he was still an opposition politician, when he considered anyone negotiating with Moscow was a “traitor”. Today the new enemy appears to be the West. “We must save Brussels from Sovietisation, from people who want to tell us who we should live with in our countries,” he says. Orban’s position has enraged half the population. But he has not obtained what he wanted from Brussels. The EU has rejected his economic plans, which went easy on Hungary’s public debt. So Orban turned to Moscow to get a better deal, whose strongman certainly shares some of his views, above all his nationalism. Hungary signed a big contract with Rosatom, and in exchange Putin promised a big financial aid package. Russia will lend Hungary more than 10 billion euros to pay 80% of the costs of the expansion of its Paks nuclear reactor, the only one in the country, which provides 40% of the nation’s electricity. The deal dates from January 2014, when it threw a cat among Brussel’s pigeons and was highly controversial. For Putin it was much more than just a contract. It was yet another economic pawn placed on the European chessboard and an extension of Russia’s sphere of influence. Today Hungary is Russia’s strongest ally in Europe. “Hungary’s position on the sanctions is that they’re useless and have proven to be unsuccessful and we are not lobbying for lifting the sanctions because of Russia, we are lobbying, or we are speaking in favour of lifting the sanctions because of Hungary,” says Hungary’s Foreign Minister Peter Szijjarto. Orban heard one phrase in Donald Trump’s inauguration he would have completely identified with. “Every nation has the right to pursue its own interests first of all”. Orban may hope Trump’s election and his cultivation of better relations with Moscow may help a new order emerge in which he is able to throw off the shackles of Brussels.